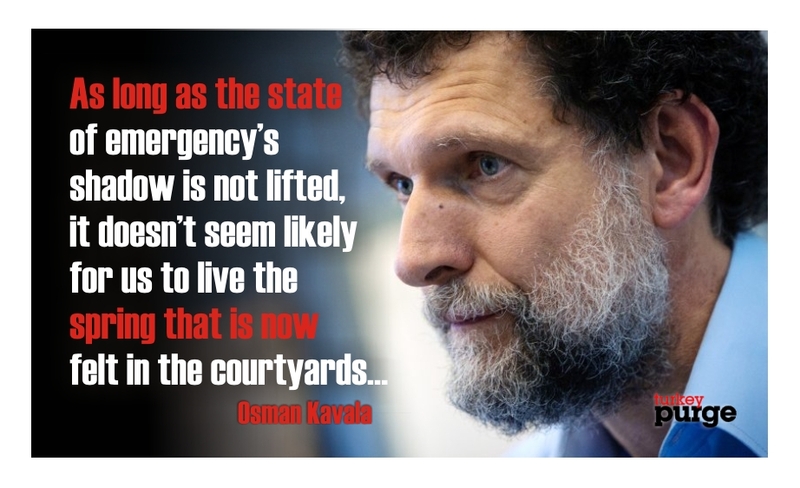 Osman Kavala, a Turkish businessman and activist who has been held in pre-trial detention since November 2017, has written an open letter from İstanbul’s Silivri prison, in which he said the ongoing state of emergency has turned extraordinary accusations and victimization into common phenomena in Turkey. “Without having any concrete evidence, they easily accuse people of committing serious crimes such as being a member of a terrorist organization, changing the constitutional order and overthrowing the government,” Mr. Kavala said in his letter. Detained upon his arrival to İstanbul’s Atatürk airport late on Oct 18, Kavala is accused of “attempting to abolish the constitutional order” and “attempting to remove the government of the Turkish Republic,” according to media. Media also said Kavala has been under investigation in the same probe that led to the jailing of US consulate employee Metin Topuz over alleged ties to Turkey’s Gulen group on Oct 4, 2017. Turkish government accuses the group of masterminding the July 15, 2016 coup attempt while the latter denies involvement. Kavala was born in 1957 in Paris and studied economics at the University of Manchester. Upon his father’s passing in 1982, he took over the management of the Kavala Companies. I have completed the fifth month of my residence in Silivri. I’m healthy and I walk for almost two hours everyday in my courtyard. I don’t have any complaints regarding the food. I started wearing glasses through the recommendation of the prison doctor and this made it easier for me to read. Time goes by in between reading, taking notes, walking, doing the laundry and cleaning. They notified me last week that the restrictions on my case were abolished. Writing and receiving letters and being able to see the lawyers more frequently will make my life easier here. The other important change in my situation is the sun starting to make an appearance in my courtyard. After its absence over the fall and winter, it is finally making an appearance over the walls; this gives me a sense of relief. Even though we can’t see what it has brought and we can’t smell its scents, spring is also felt within the courtyards of the prison. Now we are looking forward to the sparrows building their nests and visiting our courtyards for subsistence.